The recent destruction of historic cave dwellings and the relocation in May of the 15th-century Zeynel Bey Tomb -- the first of nine monuments the government plans to move -- have been disheartening events to witness for those of us who love Hasankeyf. But the fight is not yet over. Our allies at the Initiative to Keep Hasankeyf Alive (Hasankeyf'i Yaşatma Girişimi) have announced that 23 September 2017 will be the second global action day for the defense of Hasankeyf and the Tigris River. 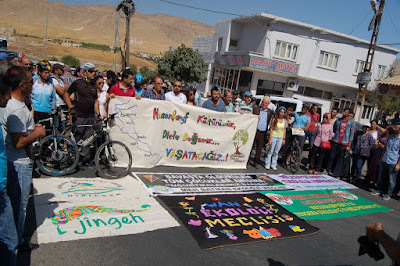 They are calling for activists, members of social movements, NGOs and others all over the world to protest the controversial Ilısu Dam project that threatens Hasankeyf and communities far beyond. Since the first global action day in September 2015, construction of the Ilısu Dam and Hydroelectric Power Plant has continued without a break, with protests in Turkey suppressed under emergency rule. But demonstrations have resumed with new energy since part of the castle rock at Hasankeyf was destroyed in mid-August 2017 using explosives and other means, an action taken without proper legal permission. This latest development marks the start of a new level of destruction of the outstanding and unique cultural and natural heritage of the 12,000-year-old settlement of Hasankeyf and the surrounding Tigris Valley. It is also pushing people out of their homes in Hasankeyf. At the same time, these actions have brought activists and organizations from all over Turkey, as well as Iraq and Iran, together in opposition to the Ilısu Dam project. Hasankeyf has a strong symbolic value for all people in Turkey struggling against dams and other destructive investment projects, and many activists from all over the country are expected to come to Hasankeyf to show solidarity on 23 September 2017. The Turkish government has announced several times that construction of the dam is nearly complete, though this is difficult to independently verify. What is important is that we stand together against this project which will destroy a whole region while benefitting only a few. Along with the Initiative to Keep Hasankeyf Alive, we invite all people concerned about Hasankeyf to organize a public action in your city or country on 23 September 2017 against the destructive Ilısu project. The demands of such protests should target the Turkish government, the Austrian company Andritz -- the leader in the Ilısu consortium -- and request action from the Iraqi government, which has thus far been silent about the effect the dam will have on its already strained water resources. Please share news and photos of your action with us, and on social media, using the hashtags #HasankeyfeDokunma ('Don't Touch Hasankeyf') and/or #HasankeyfeSesVer ('Speak Out for Hasankeyf'). The struggle continues -- Hasankeyf Yaşasın! Long Live Hasankeyf!